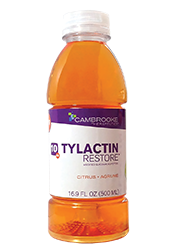 Tylactin RESTORE is a great tasting hydration beverage for the dietary management of TYR types I, II, III. RESTORE comes in a great citrus flavor and is ready to drink in clear, recyclable bottle. RESTORE is a medical food formula that contains Tylactin, the proprietary, advanced formulation of glycomacropeptide and essential amino acids without added phenylalanine and tyrosine. Phenylalanine is not added because phenylalanine naturally converts into tyrosine. Hydration beverage with electrolytes and B vitamins.